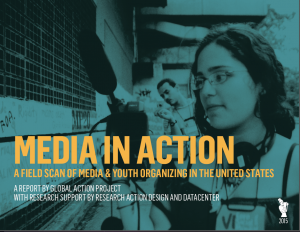 We are pleased to announce the launch of the national report: Media in Action: Field Scan of Media and Youth Organizing in the United States, by Global Action Project, with support from Data Center and Research Action Design. The report is available on-line for download or for viewing here! Media in Action seeks to understand how youth organizers are using media to advance social justice and movement-building work throughout the United States. Our research documents the dynamic ways youth organizers are integrating media strategies in their organizing work and using it to frame community narratives. The report offers these findings and actionable recommendations for funders, youth organizing groups and allies towards supporting youth media makers and organizers, as we collectively work to increase the scale and impact of youth-led work on the ground.